Wedges come in all shapes, sizes and colors, and we’re drooling over this diverse array of them for spring. 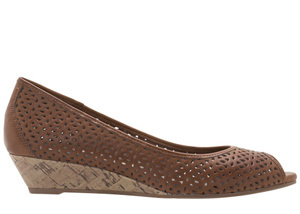 Wear them with jeans and a cute top or a flirty spring dress and you’ll be good to go! Bold prints are hot for spring, and if you’re experiencing the unseasonably warm temperatures many areas in the country are, go on and break out an open-toed platform wedge with a fun print. We’re currently crushing on these silk-tie wedges (above) from UGG ($150, uggaustralia.com) — yep, the brand that brought you the world’s most comfy boots has quite stylish wedges too! Suede is a perfect winter-to-spring transition material and looks chic on a short wedge. We plan on flaunting these taupe Merona Milena Suede Wedges ($30, Target.com) during these last few cold days and on cool, sunny spring ones alike. If you’re lucky enough to live in a climate where you can dare to go open-toed this spring, these sleek Umberto Raffini Caterina wedges ($140, thewalkingcompany.com) are a perfect option. The woven front mixes nicely with the gladiator-style ankle and heel to create a unique, on-trend look we love.